Our shop is equipped with 4 water filters, air-conditioner and heater, as well as air filter and ozone disinfection. Ozone disinfection is the safest form of water disinfection since it uses breathable air to kill germs. It is a very strong, broad spectrum disinfectant that is widely used in Europe. Unlike public swimming pools that uses bleach or chlorine which are harmful to baby's delicate skin, these filter and disinfection methods are completely safe for babies even if they accidentally drink the water. All pool temperatures are maintained at 34-36 degrees Celsius. Our spa room temperature is maintained at 27 degrees Celsius all year long for your baby's comfort. Additionally, we use Impart's Defender Air Filter that is able to filter out 0.1 micron micro-organisms and allergens to maintain indoor air quality and safety. For bottle feeding needs, we offer Impart's Excel FX filtered water for drinking. For breast feeding, we have a nursing room on the same floor in the mall that provides a couch, a sink and a diaper changing station inside a lockable room. These equipment, along with MTR mall's high standards in fire, electric and water safety ensures that parents can have peace of mind when in our shop. We have four individualized swimming pools and one large communal pool to suit the growing needs of babies ages varying from 3 weeks to 2 years. The small pools are filled with a new tub of filtered water maintained at 35-37 degrees for each swim. 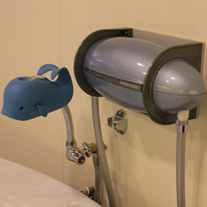 We are the only store in Hong Kong with these customized pools that have shower heads for easy cleaning, no LED lights that can be harmful for babies if they stare at them, and no Jacuzzi functions that create water currents which not only imped baby's ability to learn to swim, but its internal pipes can easily harbor germs that cannot be cleaned. Our large pool can have up to 6-7 babies swim together comfortably. This large pool allows babies to have group play interactions, as well as more room to exercise. The large pool is equipped with 3 water filters and ozone disinfection, and the water is changed everyday. All tubs large and small are cleaned after each use with U.S. imported BabyGanics plant based organic cleaner. Our store has a wide selection of floats and swim toys to suit babies of different sizes, weight, and ability. All our floats and toys are BPA free, Phthalate free and made from baby safe materials. We clean the floats and toys after each use with Japanese imported SUZURAN Baby Bottle Cleaner, which is formulated with edible ingredients and has no fragrance or color additives. This is because we know that babies like to put just about anything in their mouths. For newborns, we have Swimava's petite size neck rings. 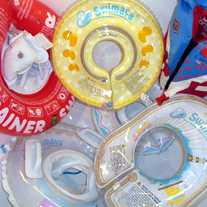 For older babies, we have the standard Swimava neck rings that allow babies to move their hands and body freely in the water. For babies who are able to sit by themselves, i.e. support their upper body weight, we have the Swimava G2 body ring and the Fred's Swim Trainer Suites for them to try. Depending on each baby's weight, ability, and adaptability to water, our staff will choose the right type of float for each swim session. 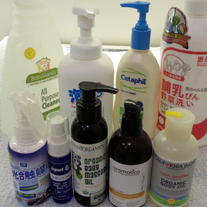 Ranging from massage oils and lotions to cleaning agents, we only use the best and the safest. For massage oils, we use US and Europe imported products such as California Baby Super Sensitive Organic Massage Oil and Aromatica's Pure Jojoba Golden oil. All our oils are plant based and organic so that they can be absorbed easily by baby's delicate skin, low in allergy, and safe if ingested. For bathing, we use Japanese imported SUZURAN low allergy Total Hair and Body Foam which has no fragrance, color additive, or mineral oil. It's weak acidic formula is mild to baby's skin and help maintain optimal pH balance. For body lotion, we use U.S. imported Cetaphil RestoraDerm Skin Moisturizer that is available for purchase only through dermatologist and specifically formulated to help prevent eczema and other skin allergies.